Automotive Nonwovens: Solid gains through materials substitutionprovides the latest analysis of the fast-altering automotive nonwovens industry. 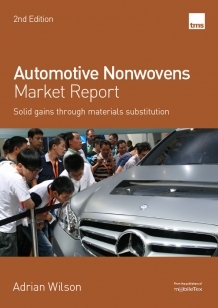 Featuring an overview of the automotive market and the wide-ranging use of nonwoven materials in vehicles, this report examines in detail the current global structure of this industry, with profiles of around 60 of the most influential Tier 1 and Tier 2 players that use nonwovens in automotive applications, and explains where the growth will be in the next 25 years, and why. Nonwovens are expanding rapidly in the automotive sector as consumers demand greater comfort and safety, and automakers and their component suppliers seek to decrease costs by reducing the weight of vehicles as well as lowering fuel consumption and carbon dioxide emissions. The development of electric cars and the fast-rising push towards autonomous/self-driving vehicles promises further opportunities. Although woven and knitted fabrics continue to dominate the total amount of textiles used within the automotive sector, nonwovens are becoming increasingly attractive to designers owing to their low weight and lower cost besides other advantages, such as sound insulation. For example, Yanfeng Automotive Interiors, which makes automotive seating, overhead systems, door and instrument panels and interior electronics, is incorporating more nonwovens into its automotive components owing to their high-speed production, low cost, easy-to-mould nature and ability to make composite materials. More than 40 applications of nonwovens in vehicles have already been identified, from trunk liners and carpets to air and fuel filters, and more new end-uses are being developed continually.